Home | Vinyl Siding How-To | How To Clean Vinyl Siding | Cleaning Vinyl Siding: DIY or Not? When thinking about cleaning your home's vinyl siding, one big consideration is whether to undertake the job yourself or to pay a professional to do it. There's no hard and fast rule to follow here, but there are several factors to consider when determining whether it makes more sense for you to perform the job yourself or call in a professional. Here are some important things to consider when deciding whether to clean your vinyl siding yourself or call in a professional. Type of Accumulation: One thing to consider is exactly how dirty your home's vinyl siding is as well as the particular make-up of the particulate that has accumulated. 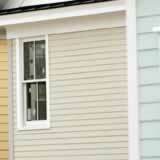 For excessive soiling, special vinyl siding cleaners may be needed. If your home's vinyl siding is excessively stained or soiled with oily chemicals, you may want to call in a professional to handle the job. Equipment Needed: Are you going to be able to clean your home's vinyl siding using the tools you already have on hand? If your home is larger than a simple, single story residence or has outside walls that are inaccessible via a simple household ladder, you will need to rent a telescoping ladder or portable scaffolding to complete the job and may want to hire a professional who already has these tools handy. Time Expenditure: Time is money and spending too much time washing vinyl siding may end up costing you more in lost time than the effort is worth. Think carefully about the total time a job like cleaning vinyl siding will take you before deciding whether to undertake such a project yourself. Your Handyman Qualifications: Are you known for your ability to handle projects around your home or do your handyman skills peter out beyond simpler projects like hanging pictures? Cleaning vinyl siding isn't the hardest home improvement job in the world but it does require some handy ability and a can-do attitude. Don't bite into a project that is too large for your abilities. When deciding whether cleaning your home's vinyl siding is a job you should take on yourself, assess the scale of the job at hand, determine whether you already have all the tools you'll need, and be realistic about your own abilities and time limitations.